Only 2 and a half mins to go! Saturday was a very hungry day; I ate only a slice of toast first thing, and then munched a couple of slices of watermelon around 2pm… No liquids after 3pm. All to the plan. 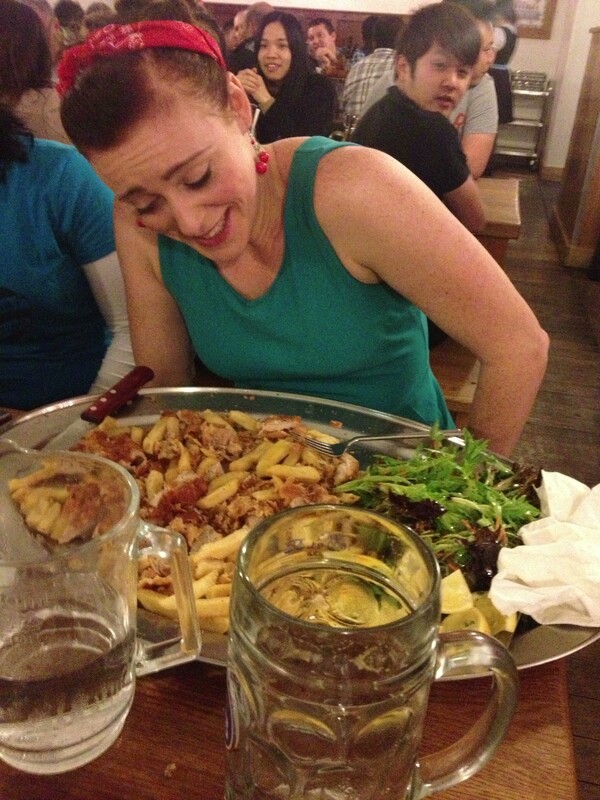 By the time we were seated at 6pm to take on the challenge I felt like I could eat a baby giraffe, and the huge plates travelling past our table with the scent of roast meat and Germanic goodness were making us all drool like Pavlov’s dogs. To cool down the schnitzel as quickly as possible I started to cut it up into bite size pieces and munched as quickly as I could, and I have to admit those first 30 mouthfuls were incredibly delicious! Tender, steaming, juicy and crunchy crumbing, really very good! The beer and chips did not get touched for at least 15 minutes, as per the game plan. 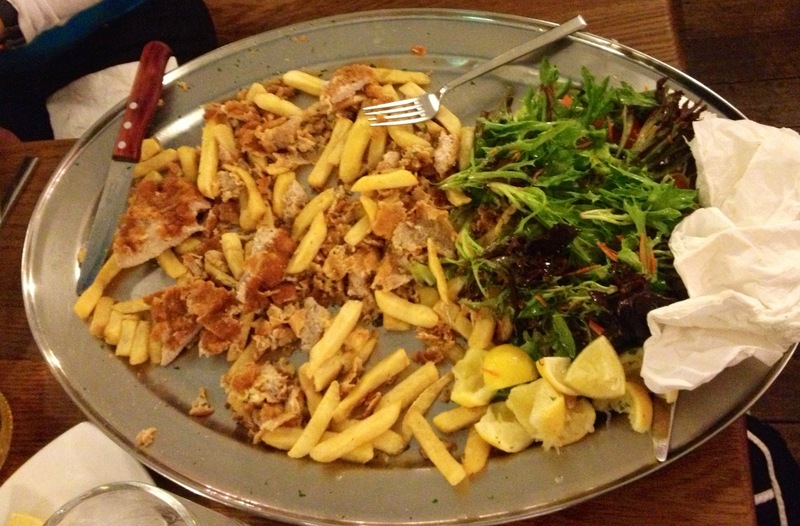 Then the schnitzel started to cool… and the going started to get tough… jaw hurtingly tough. It became chewy and incredibly salty which evaporated my saliva like a sponge, even an extra serving of lemon to squeeze over did not assist, so I had to turn to the beer. It actually wasn’t so bad once I’d chewed up the mouthfuls as much as possible and used the beer to swallow it down; my stomach was coping really well. Heck I was even dipping my chips in the beer to help with swallowing. It was time that was my enemy… well time and cold pork, but mainly time. Though I had bolted out of the gates and had eaten the majority of the schnitzel in 20 mins (much to the impressed looks of the staff) each time our waitress came over to tell us the time, I realised how much I had slowed down. My stomach was hurting, the chewing was laborious and the time was running down. When I was told there was two and a half minutes left I realised it was not going to happen. However, I did not stop eating. I had promised that I would not give up and would keep going until the final countdown. When they came over to count down from 10 seconds and I saw that there was about a pot of beer in my stein left there was really only one option. To the cheers of onlookers I necked that stein with all my might and finished it with a hearty yell whilst the countdown struck zero. I can only imagine this was incredibly attractive to my other half watching and not at all blokey and kind of Viking scary. Then it hit… like a punch in the guts. I had just eaten about 1.3 kilos of pork, at least a serve of chips and a litre of beer… and not everyone wanted to stay at the party. So we all did what only three sane people would do after a challenge like that… ordered dessert. I’m not recommending this challenge to friends, though I will recommend the food as looking great and very tasty and I’m incredibly proud that I ate more than anyone who tried that night, and more than any other female who has tackled it. Kindly, Hofbrauhaus stated they would match my $75 donation/food bill to Feed Melbourne if I lost, so at least my attempt did not go in vain! I still maintain if the challenge had been for an hour it would have been mine. impressive! 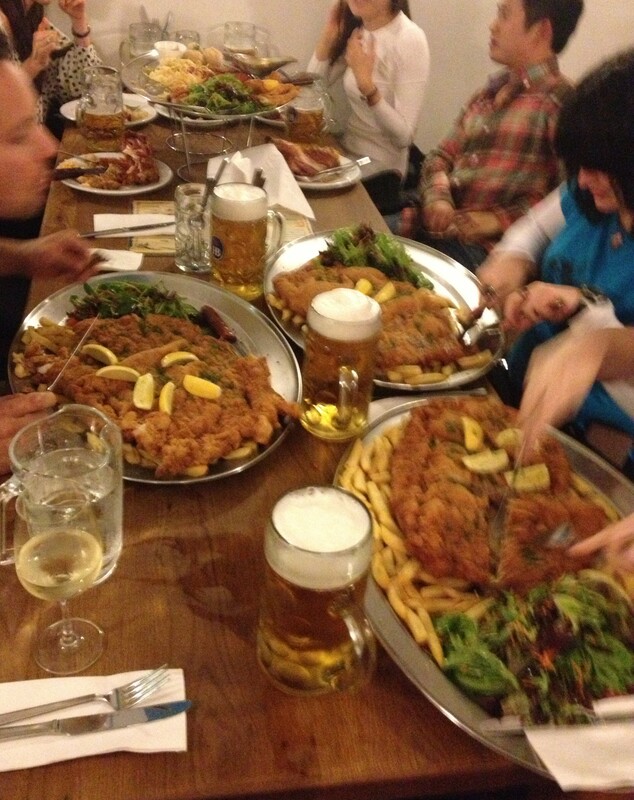 i did a similar challenge, but at a tiny little restaurant near munich far less serious with schnitzel and knödel. you fared better than i, well done! thanks! 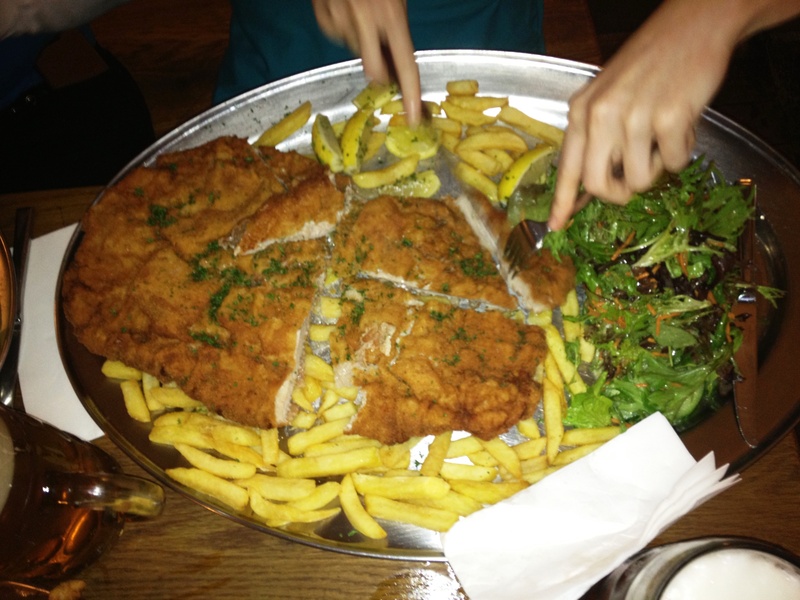 One day I hope to be able to eat schnitzel again! Oh God! I bet you never want to eat another schintzel again! Me and a few of my mates are going to do this challenge very soon. Didn’t realise it was 45 minutes until randomly Googling and seeing this blog! I, too, am a ranga and hope to get to at least your level! Not sure I’ll finish, but it’s worth a shot, right? Good luck Sean! It’s a killer and I definitely recommend putting some prep in beforehand by stretching your tummy the day before. I find heaps of watermelon works well!